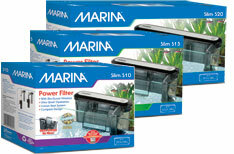 Thank you for purchasing a Marina Slim Power Filter for your aquarium. Filtration is essential if your fish are to thrive, and if your aquarium is to become the stunning visual display it should be. If wastes are not removed regularly, the change in the chemical balance of the water could prove fatal to fish. As a result it is crucial to ensure that your filter is working to its full potential. There are 2 types of filter cartridges available for the Slim Filters: Bio-Carb and Bio-Clear. Bio-Carb, a mix of Carbon and Ceramitek effectively removes toxins and increases biological filtration. It is very important to replace every few weeks to ensure that the carbon is actively adsorbing all the impurities so that your aquarium water remains crystal clear. Bio-Clear, a mix of Zeolite and Ceramitek effectively removes toxic ammonia, which causes stress on fish. Ammonia remover gradually becomes inactive, therefore it is very important to replace every few weeks. The best formula for successful fish keeping is to keep a regular maintenance schedule. By signing up below, an automatic reminder will be sent to you every month, ensuring that you are regularly maintaining your Slim Filter. It is important however not to change all cartridges at the same time to ensure proper biological filtration, so feel free to register all of your cartridges. By alternating cartridge replacement, the Bio-Guard system ensures rapid cartridge seeding of beneficial bacteria, ensuring proper biological filtration for a clean and healthy aquarium. Sign up here for your monthly reminder via email. Title : Mr. Mrs. Miss Ms. Dr.
By providing your email address you allow Rolf C. Hagen Inc. to send you exciting offers and free samples of product. Rolf C. Hagen Inc. will never share your email address with other parties. Which brand of fish food do you use?